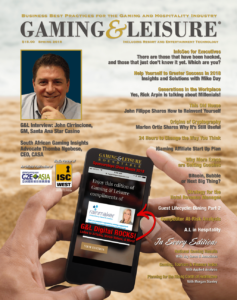 Reach the World of Gaming & Hospitality when you get a Gaming & Leisure subscription and keep up with all the latest industry news with a subscription to G&L Monthly! (When you subscribe through our website, there is no cost to you, the subscriber). Gaming & Leisure is the exclusive management periodical uniquely serving all of gaming and hospitality in North America and abroad. Gaming & Leisure is published seasonally in the winter, spring, summer and fall noting that summer is released in digital only. G&L Monthly is released via email every month. G&L Monthly is where you find your commonality with the influencers that interest you; and that’s a great entry point to a good conversation. Please send an email to info@mygamingandleisure.com with the edition season and year requested and quantity needed. Please note, summer edition is exclusively digital. The fee per back ordered edition is 15.00 US Dollars for domestic shipping and handling. Print subscriptions via our website are for 1 full year.